Moving about is a life and death matter for jaguars. As North America’s largest cat and largest terrestrial predator (excepting bears), the jaguar is often on the go. It’s all about securing enough prey over a big enough area, avoiding conflicts with other animals (including of course humans), having a variety of hideaways (for matters such as raising cubs), and learning, through trial and error, where the best places are at difference times of the year in each neck of the woods. Jaguars surely enjoy their travels through the landscape, just as we do. The jaguar must also roam in order to reoccupy areas of former habitat and extend its geographic range. For jaguars to make a come back in Arizona and New Mexico after having been trapped and shot out decades ago, they must be able to move freely across the international border, and reclaim lost terrain northward. Much of what remains of the world’s northernmost jaguar population (now extremely endangered) is located in the nearby state of Sonora, Mexico. Those jaguars are literally under the gun from ranchers and poachers, but face less development pressure on their habitat than in Arizona. 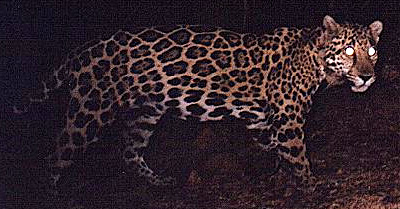 A traveling jaguar must at times leave larger blocks of habitat (places least developed, like national forest lands) and venture through what biologists call “habitat corridors” or “linkages.” These areas have some development, but not to a degree that makes it impossible for a wild animal to pass through. The future of the jaguar, and of mountain lion, black bear, Mexican wolf, pronghorn antelope, desert bighorn, and even more common species such as mule and white-tailed deer, depends on the existence of wildlife movement corridors through or around heavily developed lands. Fortunately, habitat linkage zones and corridors have been identified in Arizona and New Mexico (for more background see lifenet-sky-islands-region). Fortunately also is the growing recognition that these areas urgently need protection. For example, in 2007, the Western Governor’s Association passed a resolution to support habitat linkage conservation, and subsequently established its Western Wildlife Habitat Council. And in Arizona, a host of federal, state, and private organizations formed the Arizona Wildlife Linkage Work Group . Protection for linkage areas must be “fast tracked” given the horrid speed of land development, especially in Arizona. You’ll get a real sense for this by browsing information on the following pages — especially the photos. We provide important information on each habitat linkage for jaguar, describe the threats and what needs to be done. We challenge you to help alert the Governors of Arizona and New Mexico, county officials, members of Congress, natural resource agencies, conservation organizations, private landowners, and the general public as to the urgency of protecting these areas. Please contact me if you’d like to discuss, or have important information to add here. NOTE: This section “Habitat Linkages” is currently being updated (May 2011) so please be patient as we continue to add and improve information. Thank goodness for this blog! It is so helpful, and encouraging, to see this kind of plain-fact, common-sense language about what jaguars need and what can do to help them. Linking (literally) the fate of the jaguar in the wild to the fate of other species in the wild is also very enlightening — very reinforcing. We all know it .. sense it … but it is helpful to see the cat in the context of mountain lion survival, pronghorn survival, Mexican wolf survival, etc. I’m so grateful, Tony and others, to be involved in this project. Lets go! My buddy Eddie Gallegos has seen a grayish black jaguar 3 weeks ago here in Las Vegas New Mexico take 2 24′ foot jumps across the 47 ‘ foot wide road directly in front of his vehicle…then it stopped and turned to look at him. The town is at 6,500’ feet above sea level alongside the East slope side of the foothills of the Sangre de Christos Mountains in the Rocky Mountain Range. Last week a lady also saw this same creature in her back yard and she told some workers doing handyman labor on her property so these guys told Eddy about her siting. Yes, this is a huge investment by the federal government to the tune of $771,000 to study jaguar occurrence in Arizona and New Mexico. Ironically, at the same time, the US Fish & Wildlife Service bemoans a lack of funding when asked to provide staff and financing to collaboratively protect vanishing habitat for jaguar, Mexican wolf, and other endangered wildlife for which it is directly responsible. The Southwest is facing a very serious habitat fragmentation crisis. Private organizations and individuals struggling to address this crisis are simply overwhelmed and under-resourced. Without habitat protection, jaguars cannot survive, no matter how much money goes toward more research. Please urge the US Fish & Wildlife Service to make habitat conservation, and especially protection of remaining habitat linkages, the number 1 priority. The Jaguars are listed under the Endangered Species Act, which is administered by the US Fish & Wildlife Service. I will continue to study and sign online petitions concerning the survival of the Jaguar, and endangered species in general need to be taken more seriously. In the meantime, I wish for no harm to come to the Jaguars recently sighted. I realize your organization has the intelligence to educate the public, and if you could compose more petitions/alerts, etc. to raise awareness, I would gladly spend time spreading the word via the internet and word of mouth. Time may be running out, but I won’t give up on these awesome creatures. Please let us know what we, the concerned citizens can do to help. Thank you. Thank you, Sshanti, for your information, and kind thoughts and great suggestions! “Please provide staff in Arizona and New Mexico to protect connectivity habitat for the endangered jaguar and Mexican wolf. Habitat fragmentation is a huge problem in the region. To be sure, recovery goals for jaguar and Mexican wolf cannot be met unless habitat corridors and linkages are protected. Regional US Fish and Wildlife Service officials say that they do not have staff and resources to address this problem. As the nation’s lead agency for endangered wildlife, The US Fish and Wildlife Service has the responsibility to work with other public agencies, local and state governments, and the private sector to recover these endangered species. You may want to also send a letter such as this or even create an online petition with a similar message (if so, we can post the link on our Welcome page and otherwise spread it around).